This baked delight is supposed to be a classic Greek dish. Typically, it is made of eggplant and lamb mince. We're not overly fond of lamb mince for regular eating. So I used the next best thing, beef mince. I find it more flavorful. Now let me tell you something about this dish. It is good, really good, so very good. Sometimes, I wonder why I don't make it more often. Hmmm. Anyway, each time I make it, it gets polished off. Ofcourse, one casserole lasts us a couple of meals atleast. But what I'm trying to say is none of it ever goes to waste. I use Nita Mehta's recipe from her book "Continental Cooking for the Indian Kitchen". 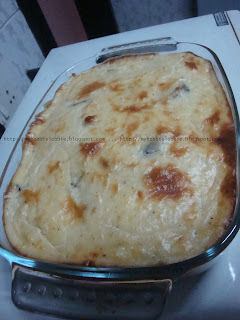 I'm pretty sure this recipe will not be a classic Moussaka recipe, but nevertheless, its pretty darn good. The inside still remains luscious, moist and full of flavor. Thinly slice the eggplant and arrange them on a platter. Sprinkle salt on both sides of the slices and let it stand for about 1/2 an hour to drain the juices. Rinse in cold water and pat dry. Heat some oil in a pan. Fry the slices till brown. Make sure you do not burn them. Drain on absorbent paper towels and keep aside. Heat the olive oil in a pressure cooker. Add the onion and stir fry till they soften a little. Add the chopped garlic and stir fry till the onions turn pink. Add the tomatoes and stir fry till the juices evaporate. Add the mince and cook on a high flame till brown and dry. Add the tomato puree, chilly flakes, oregano, salt and pepper. Add 1/2 to 3/4 cup of water and pressure cook. After the 1st whistle, simmer on low flame for 2 minutes. Remove from the gas and cool till the pressure dies down. Open the cooker, check for tenderness, adjust seasoning if needed and cook till almost dry. Dry the excess liquid but don't make it too dry. Keep aside. For the cheese sauce, heat butter in a saucepan. Add flour and cook on a low flame for a minute till it changes color slightly. Remove from the heat. Add the milk and mix well. Return to heat and cook till the sauce thickens. Add salt, pepper, mustard and cheese. Remove from the heat and cool slightly. Add the beaten egg to the cooled white sauce. Keep aside. Spoon half the meat mixture in a shallow ovenproof dish. Top with half the eggplant slices. Repeat with a layer of the rest of the meat and top that with the rest of the eggplant slices. Pour the cheese sauce on top. Cook in a preheated oven at 200ºC for 25 to 30 minutes or until bubbling hot and browned. I don't know it my comment got through are not. I really can't wait to make this recipe. We love eggplant and your recipe looks delicious. Thank you so much for sharing with Full Plate Thursday and come back soon. Have a great week end! Oh this sounds delicious. I love moussaka, and this version has some lovely flavours in it. I especially like the mustard in the topping - it would add a lovely zing! Thank you for sharing this recipe with the Hearth and Soul blog hop. 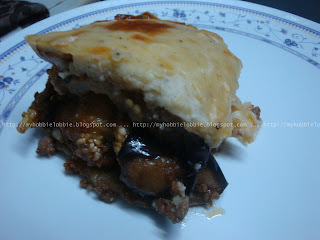 Mmmm...I love moussaka, but haven't had it in years. I'm with you -- not terribly fond of lamb mince in dishes like this. Your beef version sounds perfect! Hope you had a great 4th July weekend! Have a good week! Thanks for stopping by!